Romhacking.net - Review - Thank god! Annoyed by the loud, obnoxious voice acting in the DS version of Battle Network 5? Then this is the patch for you! This patch removes all voice acting from the DS version of MMBN5. All other sound effects and music remain in the game; only the voice acting has been removed. Installation instructions can be found in the Readme included in the download. This patch is intended for the American release only. 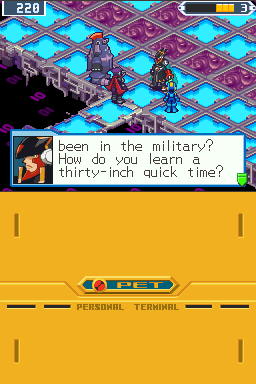 Probably my only complaint with the DS version of Mega Man Battle Network 5 IS the voice acting. 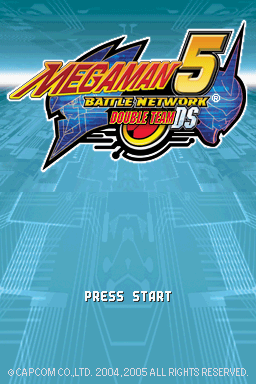 It is the only thing I can complain about; and given how much I can recommend this version over the original MMBN5, if a patch can remove my one and only complaint regarding MMBN5’s DS version, then I can recommend MMBN5 on DS all the more.